Sunday is the day of my show opening! The paintings are all ready to be hung and packed for the trip. I hope to see some of you there at the Hendrick Hudson Library, 185 Kings Ferry Road, Montrose NY. The opening reception is from 3-5pm on Sunday, Sept. 30, and will be up until October 27. You can now follow me on both Instagram and Facebook! You’ll find me on Instagram as jamie.williams.grossman. I’ve just started posting there in the past week. I’ve been on Facebook for years as “Jamie Williams Grossman”, and you can follow me there too. So, if you feel you don’t get enough of me on my blog, and you’re on one of those social media platforms, you can check out my work there too. 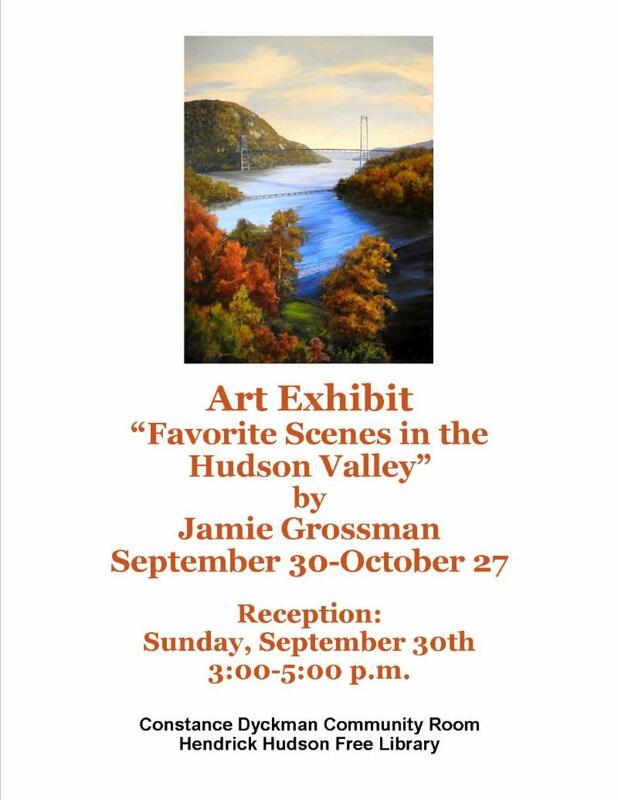 If you’re in the Hudson Valley or plan to visit soon, please come see my show at the Hendrick Hudson Library in Montrose NY! The show opening reception is Sunday, September 30 from 3-5pm, or you can see the show during regular library hours until October 28. The library is located at 185 Kings Ferry Road, Montrose NY. Click here to see the library hours and for directions. The show is in a beautiful, large upstairs space, with 81 linear feet of hanging space! You’ll see a lot of new work from me there which hasn’t yet been posted to my website. The show features Favorite Scenes of the Hudson Valley and Hudson River. 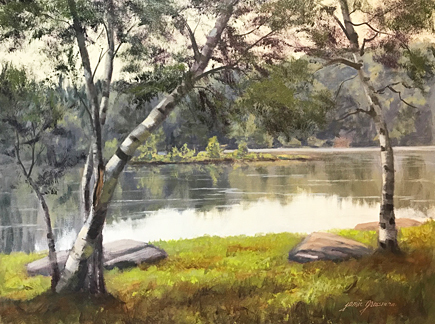 The painting above, Lake with Birches, is one of the new pieces that will be in the show. It’s a 12×16″ acrylic. I hope to see you there! This Hudson River School site in the Catskill Mountains is one of my favorite hike destinations. I go up there several times a year, and understand why it was also a favorite of the Hudson River School painters! This is probably destined to be my last Sunset Rock painting before the fall colors take hold. 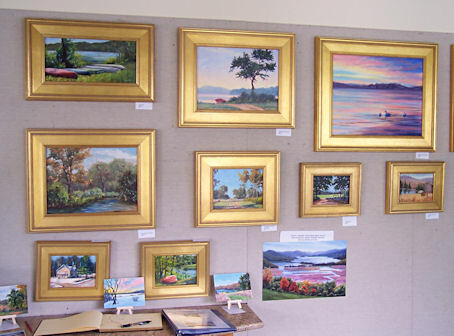 Speaking of the Hudson River School, for those who have not gone to the Thomas Cole Historic Site in Catskill NY to see the Sanford Gifford show, you have until October 29 to do that. I just went back for the second time, and it’s truly a “Don’t Miss It” exhibit for those who love Hudson River School art, art history, and hiking in the Catskills. 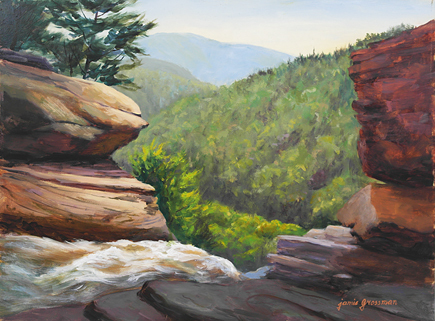 The show focuses on Gifford’s paintings done in the Catskill Mountains, and provides site information for where they were all painted too. There is also a show catalog available at the Visitor Center there. Finally you can see 19 of my waterfall paintings in one place! 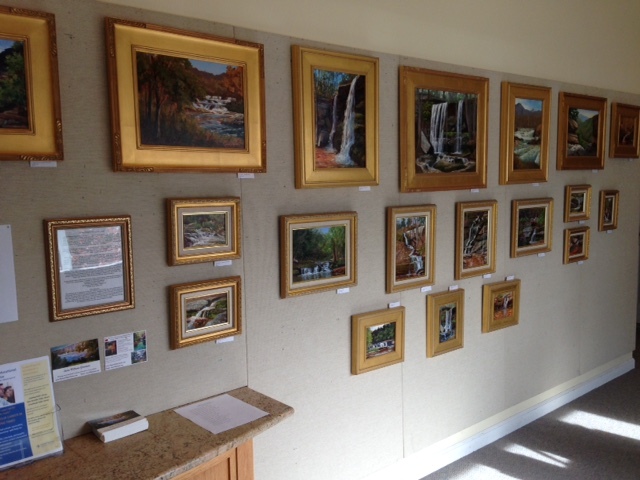 For the month of November, I have a show of Hudson Valley Waterfalls hanging at the Ruth Keeler Memorial Library in North Salem, NY. The show can be viewed during regular library hours. The paintings are for sale both at the library and here on my website. 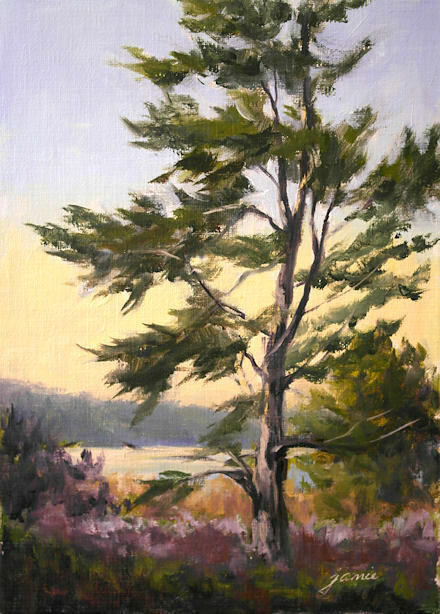 To see the paintings that are in the show, you can click the Ruth Keeler Library Gallery category here on my blog, and scroll down the paintings. I think there are still a couple that haven’t yet made it onto my blog, but they will be added soon. Or better still, go check out the show and you can see them all in person! $675.00 plus $25 shipping and insurance within the Continental United States. For local sales, shipping charge will be allocated to NYS Sales Tax. Please email me at JamieWG@aol.com for International purchases or with any questions. This painting has been in progress for a really long time. I spent a few days out on location painting the falls, trying to capture the light very early in the morning, while the foreground was still in shadow. I worked on it in between in the studio. Finally I am considering it finished. In fact, it is varnished, framed, and hanging in it’s new space at Bistro Brie & Bordeaux in Windham, New York! $200.00 plus $15 shipping and insurance within the Continental United States. For local sales, shipping charge will be allocated to NYS Sales Tax. Please email me at JamieWG@aol.com for International purchases or with any questions. I have big news! 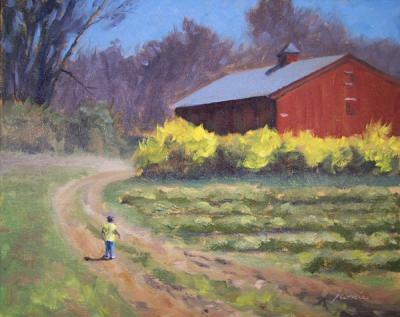 Jurors have gone through the artist applicants for the three day Olana Paintout and Art Auction on October 3-5. They have selected twenty-six artists for the event, and I am one of them! 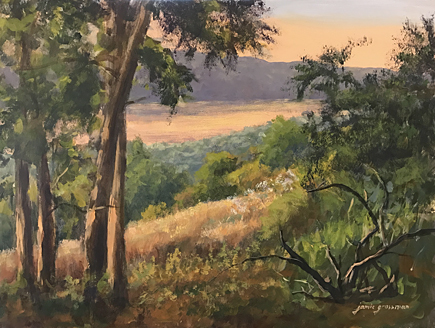 So I’ve been spending some time strolling the grounds there and doing lots of small plein air pieces at different times of day, to help familiarize me with vistas both old and new on the 250 acre estate. 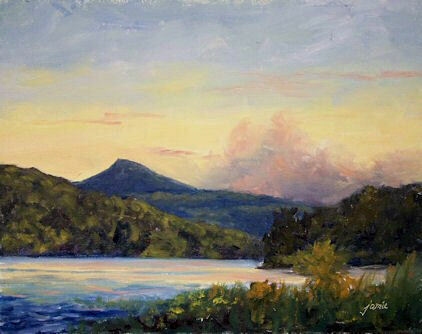 This view of the Hudson River and Catskills is not one I’ve painted before. The Hudson River appears as a streak in the foreground amidst farmland and low hills, before arriving at the dramatic skyline of the Eastern Escarpment of the Catskills. It’s quite different from the south-facing view we’re all accustomed to seeing from the front of the mansion. 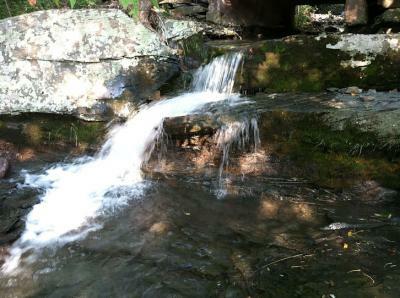 I’d like to revisit this spot a few times. This painting was done with Golden Open Acrylics. They were such a pleasure to work with, staying juicy and blendable all through the painting process. I used them on an Arches hot press board that I sealed with two coats of Fluid Matte Medium. The painting can then be varnished and framed like an oil painting. I love this surface for acrylics! It’s one of my current favorites, and the varnished paintings look absolutely stunning. I can’t even count how many sunsets I’ve witnessed at Frederic Church’s homestead, Olana. Sometimes the sun just drops like a stone and the lights go out. Other times, I’m treated to a magnificent festival of light and color. Photos from those occasions become the inspiration for many paintings in various sizes, formats, and mediums. Such was the evening of this particular sunset. The yellow light blazed behind the Catskill Mountains, and there was a red rim of fluting along the edge where land meets sky. On these evenings, one can feel Frederic Church’s passion for the view that he was fortunate enough to call “home”. 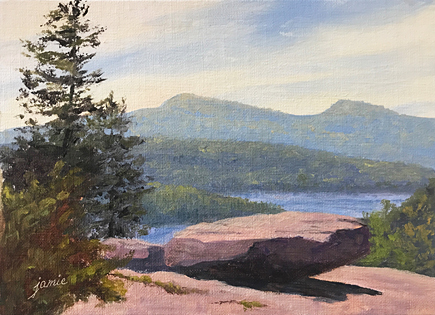 I drove up the mountain to South Lake, where Thomas Cole did his famous painting, Lake with Dead Trees, and many other Hudson River School painters did their renditions of Round Top Mountain’s peak looking down upon the lake. It was my intention to finish a painting I’d started there on Friday. However, the light was totally different, and I saw a beautiful sunset emerging. I decided to do this new painting instead, and chased the sunset to the very end. $450.00 plus $40 shipping and insurance within the Continental United States. For local sales, shipping charge will be allocated to NYS Sales Tax. Please email me at JamieWG@aol.com for International purchases or with any questions. 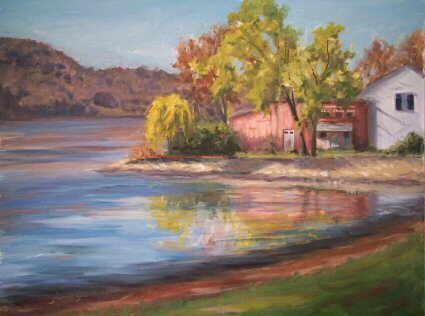 This is a scene along the Hudson River in Cold Spring, New York. I’m really enjoying doing splashy acrylic paintings on watercolor these days. I treat it like a transparent watercolor to start, using thinned Golden Airbrush paints in just a few transparent colors, splattering paint and working into it, and working light to dark in a traditional watercolor fashion. Then I go to opaque color where I want a less transparent effect. I’ve been working on this approach with acrylics for about a year now, and I feel like it’s finally starting to come together on a more consistent basis. I’m liking this one a lot! I’ve been working in the studio more lately and have noticed that I’m feeling even more exhausted than when I was traveling to locations. Yesterday the thought occurred to me that maybe the glare from working off references on my computer screen is bothering my eyes and brain, resulting in that tired feeling. Last night I decided to print out a bunch of large photos to work off of instead of staring at the screen. I feel so much better! Maybe working off printed photos will help some of you other artists out there, if you’ve had similar reactions to long days of painting while staring at a reference image on a computer screen. Take Me Home for the Holidays show opening this Saturday! 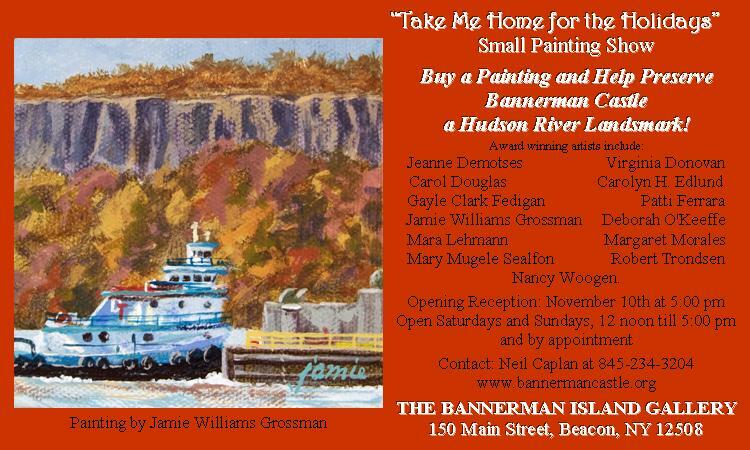 You’re all invited to my show opening this Saturday, November 10, 2012, at Bannerman Island Gallery, 150 Main Street, Beacon, New York. The opening starts at 5pm, and includes small paintings by a number of Hudson River Valley artists. These small format works make perfect and personal holiday gifts. Come say hi and browse the Beacon shops and galleries. It’s Second Saturday, so the galleries will all be having their opening receptions, and all the shops are open late. I hope to see you there! The image on the show card is a 4×4″ miniature acrylic on gallery wrapped canvas, set on a smart, black table easel. It features a tugboat on the Hudson River, with the Palisades in the background. It is available at the gallery for $150. Jamie’s Art and Music — the movie version! Many thanks to Jacob Sound for producing this wonderful video of my paintings, set to music I recorded with my duo partner, Andrew Lafreniere. The piece we play in the video is titled The One by California composer Peter Madlem. The paintings were all selected from my website by Jacob. I love the way he zooms and pans with the camera, leaving me feeling like I’m strolling through the landscapes. Some of these works are for sale and some have already been sold, so some of you collectors out there might see a painting in this short flick that is up on your wall! Feel free to contact me if you see a painting you’d like to purchase. You can contact Jacob or see more of the videos he has done on his Facebook page or via email at jacoburi306@gmail.com. On Easter Sunday, New York Plein Air Painters (NYPAP) lost its founder and leader, Ted Beardsley. Ted was one of those rare individuals who always put the interests of others ahead of his own. 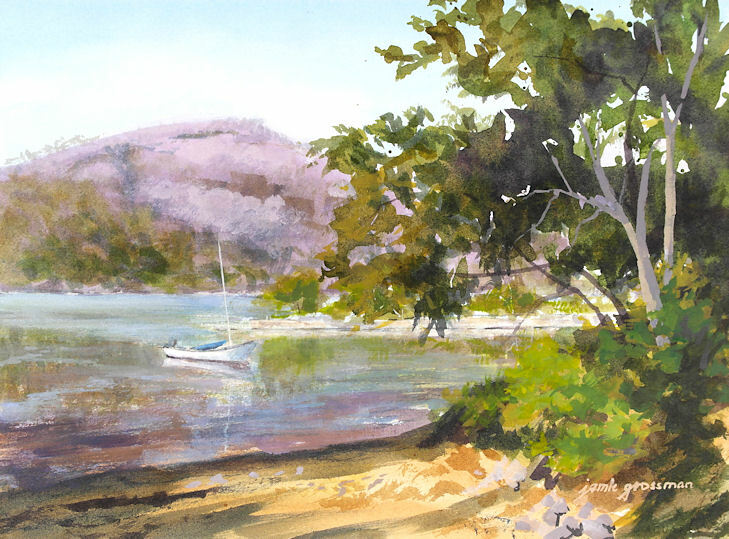 He never let on about his own multitude of accomplishments, and instead put those talents to use painting and helping promote the artists of New York’s plein air community. Ted recognized early on that a state the size of New York would have to break into smaller chapters in order to be able to serve the artists and grow. In doing so, Ted touched our lives in a very personal and direct way. He always made time for anybody who called. He directed without being pushy. He believed in an organization that would serve not only professionals, but anybody who wanted to enjoy the thrill of painting out on location, without regard to skill level. This made NYPAP an open and welcoming community. On a personal note, I will miss Ted terribly. He left very big shoes to fill. His generosity and many selfless acts will stay with me forever. I can’t even count how many artists have become my personal friends over the years because of him. 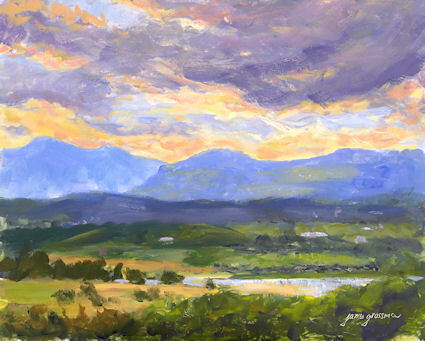 Our Lower Hudson Valley chapter is over 160 artists and growing. It never would have even gotten off the ground without Ted. I hope that wherever he is, he knows how much he has touched our lives, and how much we appreciate his kindness, talent, and compassion. My husband has been on vacation this month, hence the reasons why you haven’t seen many paintings here. If you’ve been following my sketches on my other blog, you have seen a few of the places we’ve hiked to, and what I sketched while hanging out on the patio with my Sweetheart. This past week we’ve had Hurricane Irene to deal with, and that sure packed a whallop around here. 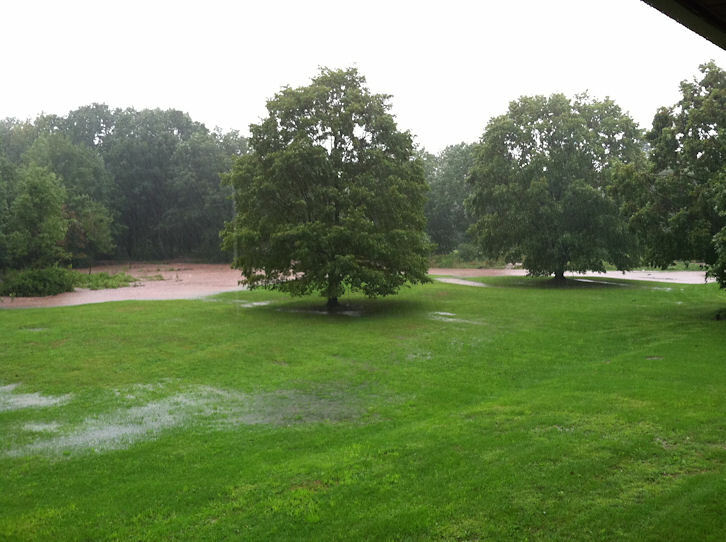 We are fortunate that our property survived quite well and we had no flooding in the house. We also managed to retain power almost the entire time. Here are some of my personal photos that show just a tiny portion of what happened around me. Here’s a photo along Kaaterskill Creek in Palenville, by the Woodstock Avenue bridge, which gives an indication of the general road conditions following Irene. The creek makes a sharp turn here, and the power of the water against the bank collapsed an entire section of the roadway. 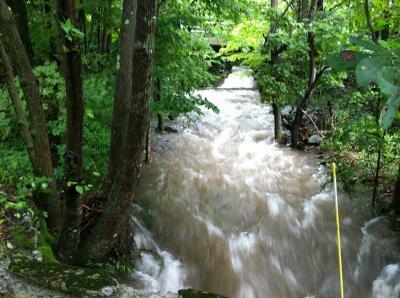 A woman’s house along the creek washed away during the storm. Well, here it is just after the storm! There’s so much water here that you can’t even see the ledges at all! 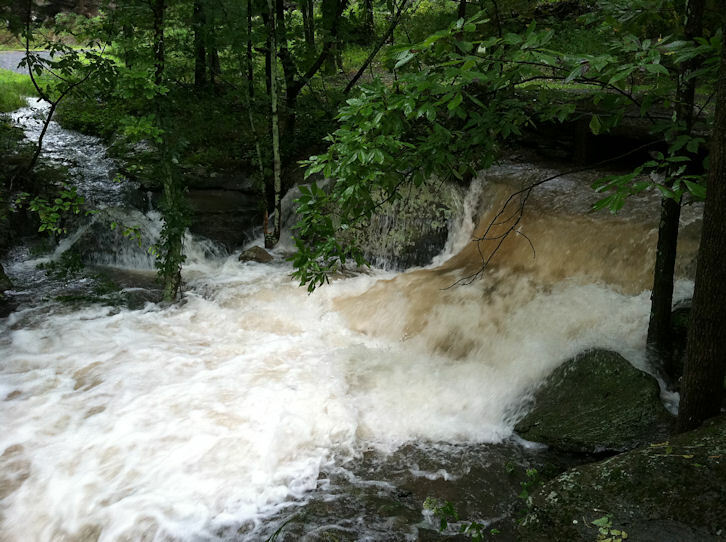 The stream couldn’t contain all the water, which is why it jumped the banks in the back of our property and flooded the yard. 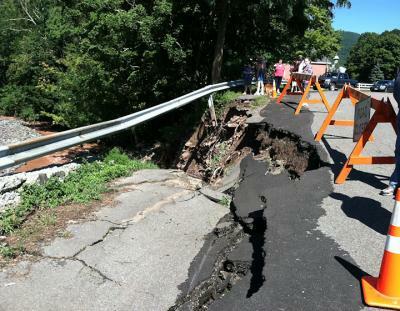 I’m so thankful that we fared better than most of the folks up here in the Catskills. So many have lost everything. It’s a real tragedy. With the sun shining and the dog playing in the pools by the waterfalls again, it’s almost hard to believe that so many are left with no homes and nowhere to go. It’s Official — I have a new blog for my sketches! I did this little 9×12″ watercolor across a two-page spread in my Fabriano Venezia sketchbook to show you what my new blog looks like! If you’ve enjoyed seeing my sketches, hearing my rambles about the artistic process, and looking on while I varnished paintings, primed panels, mixed paint, and built foamcore pochade boxes, most of those things will be posted only on the new “Sketches” blog from now on. 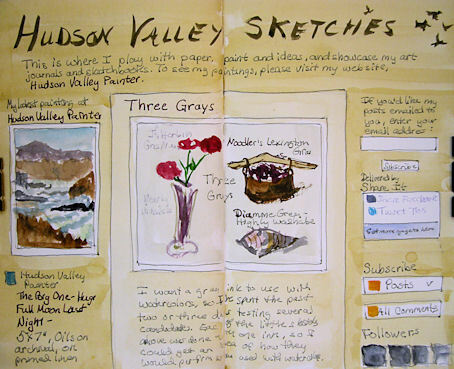 That blog is at http://HudsonValleySketches.blogspot.com. You can click here to head over there now, and subscribe there to continue to receive all my posts online. Don’t worry; this This Hudson Valley Painter blog isn’t going away! It will still be here, and will contain my completed paintings that are available for sale. The sketches, product reviews, and thoughts on the artistic process will be on the new site. 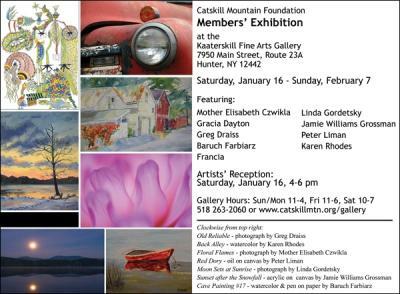 I have six paintings going up to Kaaterskill Fine Arts for this show in Hunter, NY. Hope some of you can make it there! My friend and fellow artist, Gretchen Kelly, is writing articles about some of her favorite artists. Please check out her blog post today, featuring yours truly! Many thanks to Gretchen for this special commentary. It’s been wonderful having Gretchen as a friend and painting buddy. While you’re there, take a look at Gretchen’s expressive figure drawings and paintings, and her vibrant landscapes. I especially like her use of gold leaf in some of her multi-media landscape paintings. 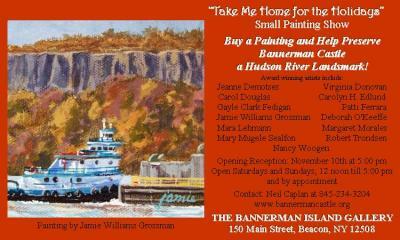 While out painting at Bannerman Island with friends two weeks ago, we were offered a show at Bannerman Island Gallery! The opening is this Saturday, November 14, 4-8pm. 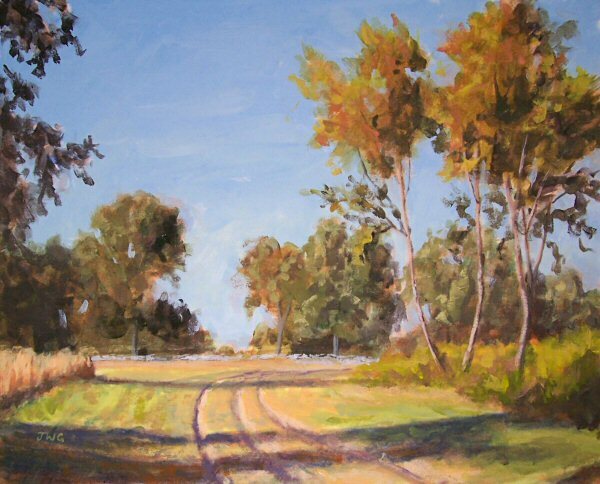 I’ll have some of my new fall works there, including the one featured below. Thank you to my guests! Many thanks to all of you who took the time out of your busy weekend to attend my Hudson River Journeys and Hudson Valley Journeys shows this weekend. For those of you who didn’t make it there, Hudson River Journeys will continue to run until October 4. 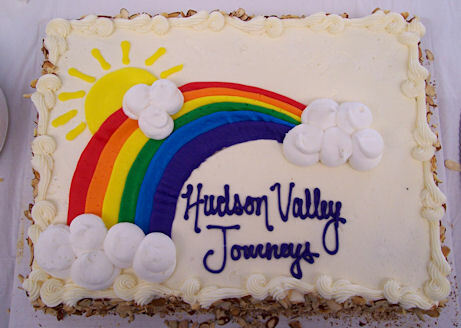 Hudson Valley Journeys runs through September 29th. The 11×17″ prints of Boscobel Overview are available for buyers of my work at either show, as well as RiverWinds Gallery in Beacon. You can see the print at the bottom of the first image below. Here are some photos I took of the North Salem Library show this morning. Unfortunately, there’s some glare with the paintings facing the windows, but it will give you an idea of what is there. 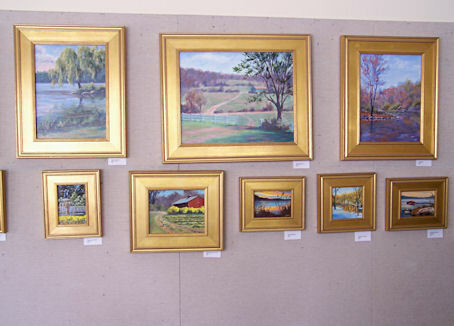 All of the North Salem paintings in the Hudson Valley Journeys show can also be purchased custom framed as shown, directly through my website here via PayPal. If you see something you’re interested in, just let me know where it is in the images and I can email you a direct link to that painting’s post with pricing information. And best of all, here is the cake for the show! Sunday, September 13, from 12:30-2:30pm, I’ll be having a luncheon reception for my show, Hudson Valley Journeys. It is at the Ruth Keeler Memorial Library, 276 Titicus Road, North Salem, NY. Please stop by, say hello, see the paintings, and have a bite to eat if you’re within striking distance! 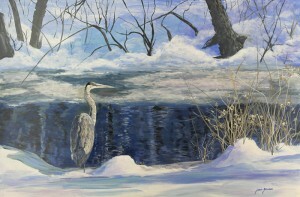 For pricing and purchase information on the painting above, click here. Come join me for a reception at the opening of my new solo show, Hudson River Journeys, this Saturday, September 12, from 4-6pm at the Bannerman Island Gallery, 150 Main Street, Beacon NY. 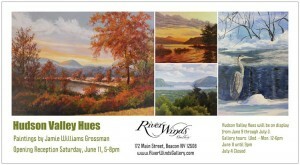 There are 24 of my Hudson River paintings hanging in the show. They show scenes of the Hudson from the Palisades up to Athens, NY. 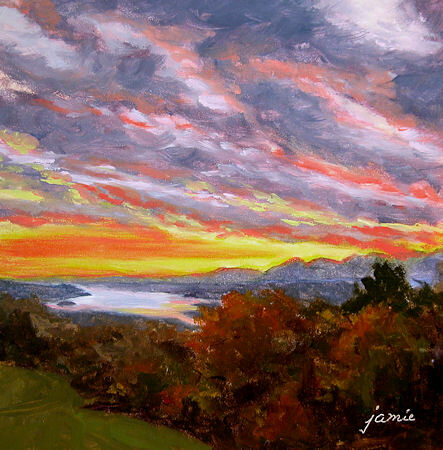 For the month of September, any of my paintings purchased at one of my shows or galleries comes with a beautiful 11×17″, hand-signed poster print of my painting Boscobel Overview in Fall for you to frame and hang. These posters are available at Bannerman Island Gallery, RiverWinds Gallery (174 Main Street, Beacon NY) and Ruth Keeler Memorial Library (276 Titicus Road, North Salem, NY). Remember that you are also invited to my luncheon reception at the Ruth Keeler Memorial Library this coming Sunday, September 13, from 12:30-2:30pm. 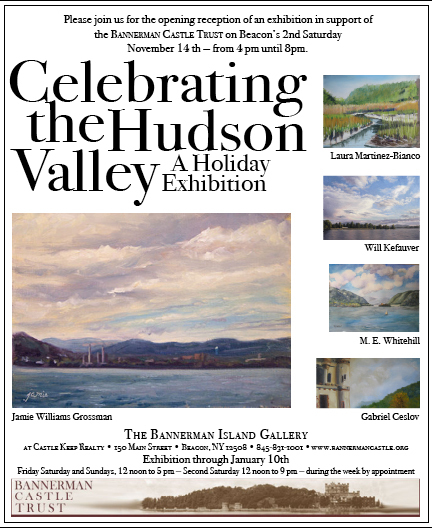 My Hudson Valley Journeys show is there. I hope those of you who are in the area can make it to one or both of these events. Tomorrow I will be hanging my solo show titled Hudson Valley Journeys at the Ruth Keeler Memorial Library in North Salem, NY. It will run from tomorrow through September 29. Please join me for a luncheon reception at the library on Sunday, September 13 from 12:30-2:30pm. The address is 276 Titicus Road, North Salem. I hope many of my viewers will be able to get over there to see the show. If you cannot make it to the reception, you can see the show anytime the library is open. Here is a link to the library hours when you will be able to see the show. The painting above is the one that appeared on the card for the show. 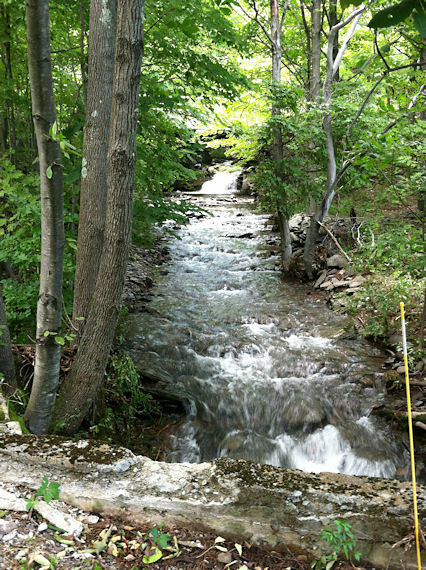 It is a view of the beautiful Open Land Foundation property along Baxter Road in North Salem. It is available for purchase at the library or through my website at this link. All of the paintings in that show are custom framed and also available through my website. 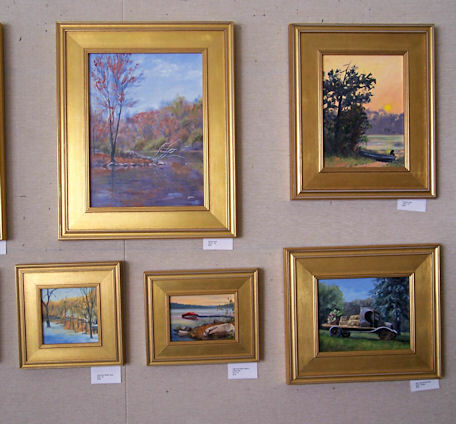 If you click the Category on the right for “Brewster and North Salem”, you will see that some of those paintings are now listed as custom framed. Those are the ones in the show. (Works not in the show are unframed.) I do not generally offer framed works through my website, so if you’re interested in something ready to hang on that favorite wall, this is a great opportunity to pick up a custom framed piece at a great price.